Former CBI Joint Director VV Lakshmi Narayana sees Chhatrapati Shivaji in JanaSena party chief Pawan Kalyan, as they both possessed same level of “fighting spirit”. Former Central Bureau of Investigation (CBI) Joint Director VV Lakshmi Narayana who recently joined Pawan Kalyan led JanaSena party filed his nomination on Friday (22nd of March) to contest as an MP (Member of Parliament) for Visakhapatnam Lok Sabha constituency. 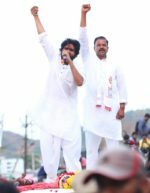 Following nomination papers submission, Lakshmi Narayana addressed a public meeting in Visakhapatnam and said he sees Chhatrapati Shivaji in Pawan Kalyan, as they both possessed same level of “fighting spirit”. code of ethics and exemplary character,” he said. in Pawan Kalyan,” formed CBI JD said. Chhatrapati Shivaji was recognized as a great national hero during Indian Independence Movement. Young leaders, and backward communities. What Motivates Former CBI JD To Join Hands With Pawan Kalyan?